Why are our wards pink today? You may notice that Westmead Hospital staff are covered in pink today. 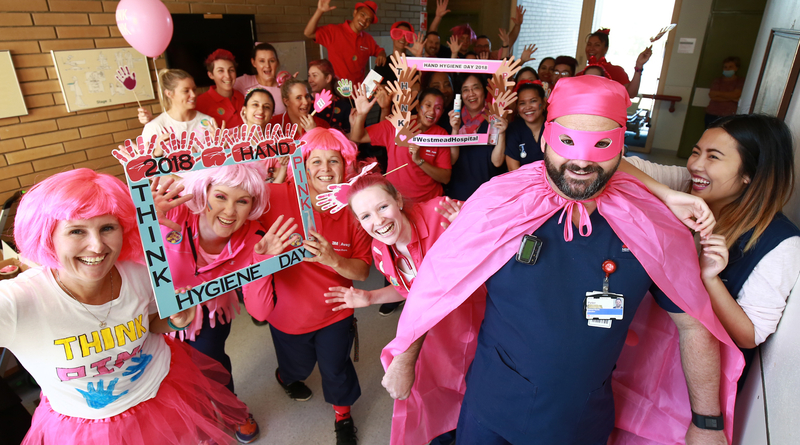 Westmead Hospital has covered its wards in pink to highlight the importance of clean hands in healthcare. The colour pink represents the hand rub provided to healthcare workers and visitors at the facility. Practicing good hand hygiene can help prevent healthcare associated infections. The national requirement for hand hygiene rates is 80 per cent compliance and in April, Western Sydney Local Health District’s compliance rate was 88.3 per cent and Westmead Hospital’s was 87.4 per cent. Westmead Hospital nurses Melanie Seyman, Rebecca Hallaway, Tamara Claxton and Kelly Bivona. Acting cardiology step down nursing unit manager Kelly Bivona said hand hygiene is a big part of patient safety. “Hand hygiene can stop the spread of infection from one patient to another or a staff to a patient,” Kelly said. Even our patients were covered in pink. Patient Aileen Baily with nurse Nathan Lovely (left) and nurse Rebecca Hardwell (right). Getting in on the pink action: Westmead nurses Peter Bilokin, Nathan Lovely and Dan O’Flynn from Westmead Hospital’s executive team.